As we age, the effects of sun damage and environmental pollutants take their toll on our skin, causing it to wrinkle, develop sun spots and look tired. A Sciton procedure (fractional resurfacing, laser peels, micro laser peels and/or phototherapy) at Premier Laser Care can reverse these effects and restore a healthy look to the skin. There are two approaches to resurfacing: full field, and fractional. In full field resurfacing, the entire surface area of the skin is treated. A laser beam is scanned across the treatment area and precisely removes a layer of skin. The body will naturally replace the old, damaged skin that was removed, with a fresh, healthy layer. Treatments can range from shallow (which might be appropriate for eliminating fine lines, sun spots and tired-looking skin) to deep (which is often used to improve skin tone/texture and eliminate deep wrinkles, even in difficult areas like upper lip lines and crow’s feet). 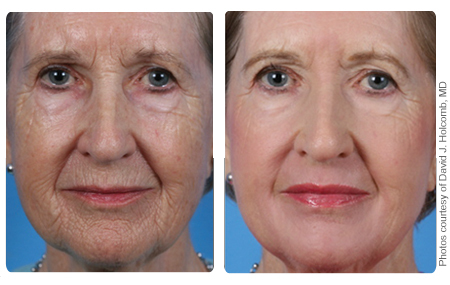 In fractional resurfacing, the laser removes pinpoint columns of skin, leaving the surrounding tissue intact. This approach allows the laser to controllably ablate and coagulate tissue to variable depth, while the surrounding intact tissue promotes rapid healing.